- Sanghyang (Trance) Dance is traditionally performed as an exorcism to promote peace and health within a village. - Kecak (Monkey) Dance, performed by a group of at least 50 men who dance in a circle around a blazing torch. - Fire Dance, where the dancer becomes entranced and is able to dance on hot coals without feeling pain. On completion of the performance your guide shall be happy to drop you at one of the many local restaurants close to your hotel- most restaurant will provide you with a complimentary return transfer to your hotel. Please not dinner is not included. 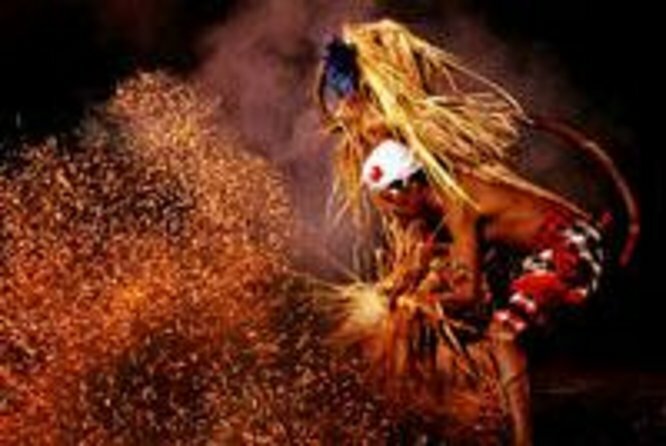 Will enjoy the three of most famous dances in the country.Sanghyang, Trance and Kecak ( Dance Dance ). Oka the guide came to pick me up at the hotel. He even bought some mosquito repellent for me to spread on while watching the kecak dance performed outside. The dance was magnificent and very entertaining. Oka was very professional. Thank you for a nice evening. This was an interesting experience! Nice way to immerse yourself into Balinese Culture. Eine wunderschöne Abendveranstaltung, die sich sicherlich lohnt anzuschauen. Kann ich empfehlen. To look absolutely at a wonderful evening event which is worthwhile. If I can recommend. Really enjoyed this tour, the dance place in a beautiful temple, and you got even buy a Bintang! Very good dance, and good information given on the history of it. The fire dance section was particularly exciting. They also took us to a coffee plantation which is next door to the dance and that was interesting. This was a great cultural evening, the guide was very informative giving me the history of the story. We were picked up from the hotel and the guide insisted on coming early. He had a driver with him which was a bit odd. We ended up waiting for the place to open for at least an hour. The show was different and also a bit scary with the Fire Dance. It was interesting to see.